We hear it all the time---"I don't want anything fussy", "I don't want to cover my view", "what if I get tired of it?" Our answer is that we don't want to cover your view and there are styles that give a more "tailored" look, not fussy. One of the treatments we consider to be tailored would be a roman shade. 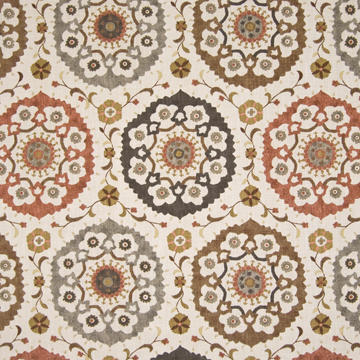 But imagine you need something with just a little more pizzaz, and only as a valance, and not an operable shade. A faux hobbled shade might just fit into that category. And by faux, we mean an un-operable shade. I guess that makes it a valance! 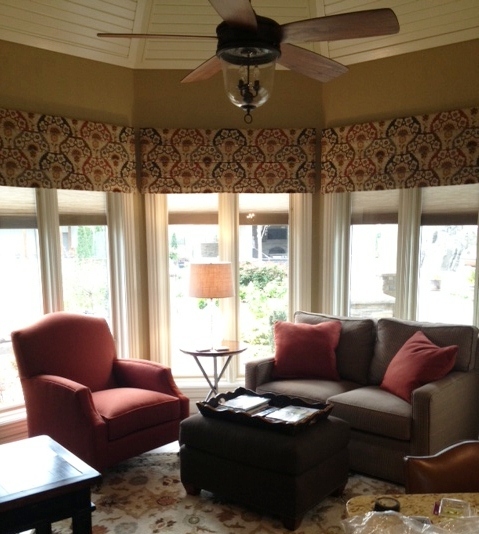 This window treatment was designed to fit closely to the window (and the sliding door not in the photo). The windows themselves have shades inclosed in the glass, so privacy was not a concern for us in planning the design. The actual folds, which is what makes a hobbled shade, were stapled on the sides to keep the fabric snug across the front and actually fabricated in separate pieces. We did not want a slouchy look, which can happen with some fabrics. This is all designed to give the room it's "tailored" look. Be aware that the hobbled style can drastically change the appearance of a patterned fabric. We loved the all the colors in this fabric, and our workroom was thoughtful in the decision on cutting, folding and lining up this fabric to make the most of every fold. If you are ready to add window treatments to your home, we can make sure they fit your style, from tailored to fussy, it's up to you! I really like that look, not only the pattern, but the tailored look that doesn't take up a lot of visual space in the room.